1067 CE: More trouble would strike again, this time in Linnefarn’s grand valley, when waves of Frostholm raiders came. Much of what lay north of the Lake of Tears was plundered and destroyed, pushing elven forces back to Windmere and Tourneuve, though Elëan troops flew eastward over the mountains. Worse, the Alorean garrison in Oosterdam fled as well, abandoning to the approaching raiders its erstwhile human allies, great throngs of fellfolk farmhands, and indentured gnomes. The hapless Rijklanders and their workers fled into nearby forests and up into the mountains while Frostholmers looted the newcomers’ towns. With word of Alorean and Gandarian forces mustering in the north, the raiders withdrew north to the grand valley and settled there for the winter. To help his followers hold on to their recent gains, Odin wisely sent them newcomers of their own, a rough and rugged people not unlike the Frostholmers. From them came the province’s name: Das Wichtelland—otherwise known as a land of imps and magical beings. Soon afterward, the Rijklanders returned to their devastated homes. 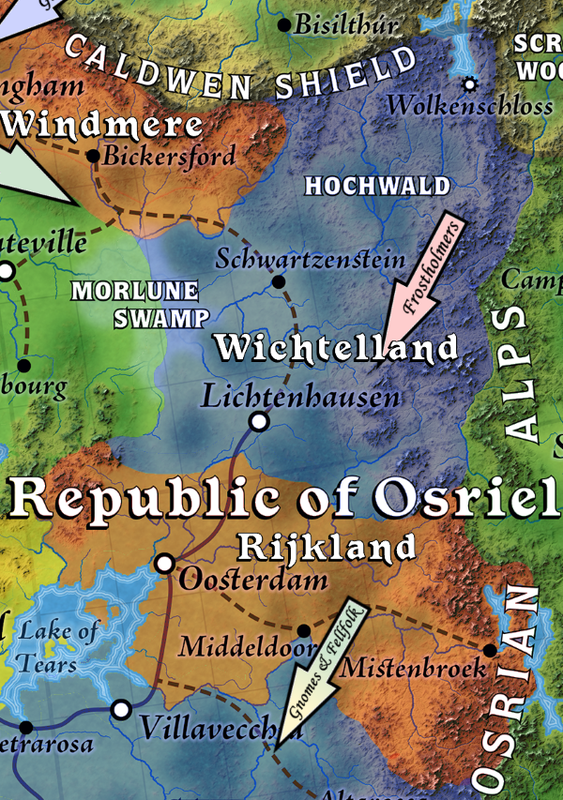 Neighboring Monfalconesi wisely offered them weapons to keep both elves and Frostholmers from returning. Fellfolk and gnomes, now culturally akin to Rijklanders themselves, earned their freedom in exchange for swearing to defend the land at the sides of resident newcomers. In so doing, they helped establish their faiths as the prevailing ones in this region. 1203 CE: Peace remained ever so elusive for the next century and a half. Border clashes were frequent in the Dawn Wilds until the whole of the Great Caldera became engulfed in the wars of independence. The Kragdûras felt cheated out of lands they’d claimed. So were the Aloreans, bitter at the dismantling of Greater Linnefarn. Seizing the opportunity, the elves marched forth, seeking to regain lost grounds and gain control of Lorical which had grown into an open city. The dwarves attempted to stop them, and the conflict came to a stalemate in 1220 CE when drafted settlers on both sides refused to prosecute a proxy war on behalf of their lunar masters. By the end of the insurrection, all three off-world empires stood defeated and licking their wounds, while the old colonies of the Great Caldera became sovereign realms. The Dawn Wilds remained but a chaotic backwater until another catastrophe came about, with the second coming of Ghüle. 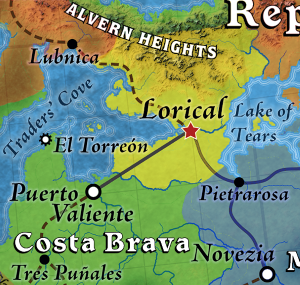 1237 CE: Much was destroyed and Lorical was razed during the invasion. The orcs, the goblins, and the trolls left as quickly as they’d appeared. Stranded, some scattered into the mountains or found entry to the underground. Towns and settlements of the Dawn Wilds were rebuilt and wounded lands reclaimed anew. Fortunes of war led followers of some cults to depart and others to arrive. In the wake of the Ghülean horrors, a monk by the name of Fra Rocco, a Monfalconese native of great wisdom and charisma, endeavored to convince the provinces to join, so that their lands could be better defended from outsiders who coveted them. He succeeded. In 1250 CE, diplomats of surrounding realms met in Lorical and agreed to leave the affairs of the Dawn Wilds to its people. 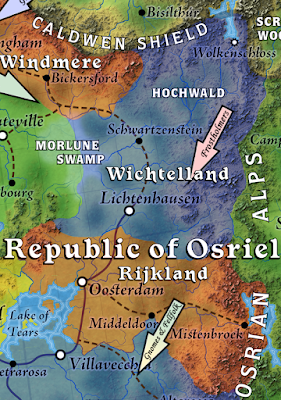 Local leaders came together in Lorical from all corners of the Dawn Wilds and founded the Republic of Osriel. Thus did citizens become free to honor their spiritual patrons, to speak whatever language they wished, and to pursue their quests for wealth and happiness, whatever their races and origins. This declaration became a cornerstone of the Calderan Faiths. Teos/Soltan: In his infinite wisdom, the Calderan pantheon’s honorary chairman adopted an attitude of liberal laissez-faire. He felt a singular distaste for being personally involved with lesser entities whom he considered bargain-basement upstarts and godly wannabes encroaching “his” divine backyard. He neither earned nor wished to earn any arcane benefit from heading the rag-tag plethora of idols, in his hallowed point of view an unscrupulous and puffed-up gaggle of rabble-rousers and also-ran. None of the members would indulge him with dues normally demanded by pantheon rulers anyway, other than a distant and polite celestial nod. The opportunity to expand his own following among mortals, however, led the mighty sun god to hold his eternal nose and stake his own share of Osriel’s business. The cults of Teos/Soltan fared slightly above average compared with individual deities. As a whole, however, competing pantheons gained the upper hand over the sun god, as his cult only prevailed in four towns of Osriel, in part as the result of Narwani immigration in the south of the Costa Brava . Though squabbles abound, many godlings have proven reasonably successful in Osriel.